This story deals with the principle of fire, the breath of life and laughing gas—in other words, phlogiston, oxygen and nitrous oxide. At the dawn of the nineteenth century, a few of the best medical minds in England were spending their days in breathless anticipation as one desperate patient after another submitted to treatment with newly discovered gases. By night, however, they could be found in the parlors of the upper class, laughing up a storm with society matrons and famous poets. We begin with the theory of phlogiston, introduced in 1667 by Johann Joachim Becher, who postulated that there is a certain substance, terra pinguis (‘fat earth’), contained in combustable material that is released on burning. Renamed phlogiston (‘burning up’) by his student Georg Ernst Stahl, it was regarded first as a particle, then an essence. Wood for example was composed of ash + phlogiston. Burning wood released phlogiston and left ash. But there was a problem. It was noted that burning lead or tin caused that substance to increase in weight. This inconsistency eventual killed the theory, but only after decades of argument. The path to the truth was an ambling one. Joseph Priestly, contemplating the effect of steam on iron, thought initially that hydrogen was the mysterious phlogiston. Eventually it became clear that burning involved not the leaving of phlogiston but the addition of oxygen, the very element co-discovered by Priestly. Lavoisier, a clever experimentalist, used closed vessels to study chemical reactions, concluding that the weight gain during combustion was due to combination with air. His most famous finding was the conservation of mass. He was well versed in the ‘foreign’ literature, much of which was translated for him by his wife. Thus he knew of the ‘fixed air’–CO2–of Joseph Black and thought, at first, that this might be what combines with combusted materials. In the meantime, Priestly visited Lavoisier and they discussed all things combustable. With renewed interest in his experiments burning mercury, he tripped onto to the idea that there was a component of air that was “better than common air, for the purpose of respiration, inflammation, and ... every other use of common air.” He called this ‘dephlogisticated air’. We call it oxygen. Which is exactly what Lavoisier called it, based on his own studies in 1778, described in the ‘Easter Memoir’. By the way, ‘inflammable air’, described by Cavendish, is hydrogen. When one combines ’inflammable’ air with ‘dephlogisticated’ air, water is produced: 2H2 + O2 –> 2H2O. But I’m sure you knew that already. Lavoisier went on to experiment with respiratory physiology, using ice calorimeters and guinea pigs to identify respiration as a process of ‘slow combustion’. The stage was set for the therapeutic use of oxygen. The venue would be The Pneumatic Institution in Bristol England, 1799–1802. With this new venue comes a new cast of characters: Thomas Beddoes, Humphry Davy and James Watt. Lavoisier had his wife as his muse. In addition to translating scientific literature into French, see made drawings of his experiments and archived his research. These fine Englishmen had the Duchess of Devonshire to count on. Thanks to Joseph Priestly and other members of the Lunar Society, ‘pneumatic chemistry’ was now ‘a thing’. Thomas Beddoes had set up a laboratory to study possible medical uses of these newly discovered gases. Conversations with the Duchess, who was ‘surprisingly’ learned in chemistry, lead Beddoes to turn the lab into a hospital. She lent her prestige to the new effort, and tried in vain to get funding from the Royal Society. Its President, however, refused to aid or abet Beddoes, a known sympathizer with the French Revolution. But the ‘clinic’ carried on. Beddoes was more enthusiastic than successful in his attempts to use hydrogen and oxygen to treat such ailments as ulcers, paralysis and tuberculosis. He did, however, publish a collection of anecdotal case histories in which other doctors claimed success. The true medical value of therapeutic oxygen would not be realized for decades. There was some silliness along the way, such as oxygen enemas for gallstones. 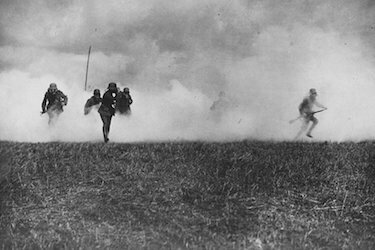 Its adoption as respiratory medicine was accelerated after WWI, where it was used to treat the respiratory effects of poison gas, including phosgene, a gas first synthesized by none other than Humphry Davy. Modern methods, as pioneered by JS Haldane, were met with reluctance. Haldane single handedly brought respiratory science into the twentieth century when he published “The therapeutic administration of oxygen” in 1917. But, there was apprehension about a sort of ‘accelerant’ effect of oxygen that would damage tissues. Respiration, after all, was a matter of ‘combustion’. For a very long time, doctors had to be coaxed into giving up timid, and useless, intermittent application of oxygen in favor of continuous flow for patients with serious oxygen deficit (…in 1972 over 10% of physicians involved in intensive therapy still prescribed intermittent oxygen). It is safe to say that oxygen has won its place in medicine, and in the psyche. Metaphorically oxygen is ‘good’. It is even sought after by the healthy as a mood enhancer, available in oxygen bars throughout ‘first world’ countries. We turn now to the tragic–o-comic story of laughing gas. Joseph Priestly, (again), first synthesized nitrous oxide (phlogisticated nitrous air) by heating iron filings with nitric acid. James Watt built an apparatus to mass produce it. And in Thomas Beddoes’ Institute, Humphry Davy explored its effects on people, including himself. The involvement of James Watt, instrument maker and inventor of the steam engine, is a poignant tale of desperation. Watt had hoped that the use of medical gases might save his daughter from tuberculosis. It did not. 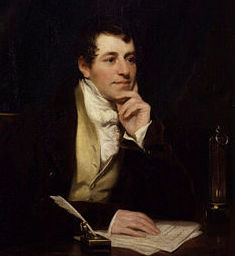 Humphry Davy came to the Institute in 1798, after his interest was piqued by an account of “the gaseous oxyd of nitrogen” which warned that it was dangerously toxic. Two years later he published Researches, chemical and philosophical, chiefly concerning nitrous oxide, or dephlogisticated nitrous air, and its respiration, in which he set forth the more salutary effects of nitrous oxide. Early on he took to calling it laughing gas. Decades later, Nitrous oxide would enjoy a brief but venerable career as an anesthetic, before it was replaced by the more potent agents, ether and chloroform. The saga of Horace Wells, who pioneered its anesthetic use, is one of fame purchased at a price too dear, of a life so twisted and dramatic the it was eventually told on stage in the play Ether Dome. Wells, a Hartford dentist, had tripped onto the potential anesthetic use of nitrous oxide while attending a traveling show that demonstrated the more amusing effects of laughing gas. Wells failed at his medical demonstration in Boston, due only to technical flaws. Once the true utility of nitrous oxide anesthesia was finally apparent, it was his partner who claimed credit. Wells’ life spiraled downward. He abandoned his family and was jailed for felonious assault on a stranger. The Parisian Medical Society was petitioned to redress his grievances as an overlooked inventor. They eventually recognized his claim as the first to perform painless surgery and awarded him an honorary MD degree. Twelve days following this public accolade, and unaware of it, Wells sat in his jail cell, inhaled some chloroform and fatally slit his femoral artery. Now, let us return to England and lighter matters, to explore the surprising confluence of medical science and the Romantic movement in literature and philosophy—the enlightenment’s version of ‘better living through chemistry’. The friendship of Humphry Davy and William Wordsworth was based on mutual admiration. Both were filled with lofty notions of humanity, Romantics if you will. Davy was a popular lecturerer, often referencing poetry, religion and equality for women in science—that, in addition to discovering six new elements and becoming president of the Royal Society. 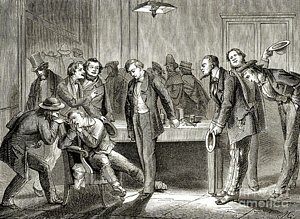 He and other intellectuals (add Coleridge to Wordsworth) took to doing what mankind has done practically forever—use chemical intoxication for fun and edification. Only in this case it involved huffing on a balloon filled with nitrous oxide. Davy may have initially asked “what will this do” but the poets wanted to know “how will this make me feel”. 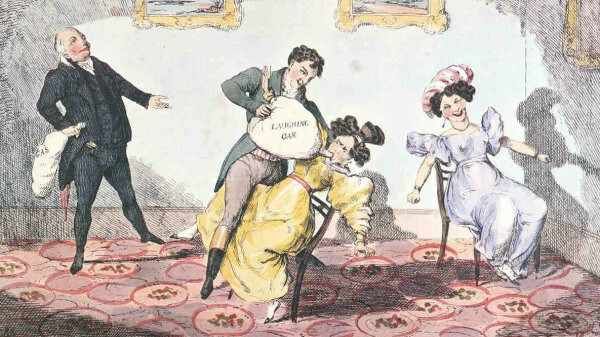 Eventually the entire British upperclass was keen on attending laughing gas parties, a past time that endures today. Millions of, mostly younger, people know what ‘whip–it’ means, even if they haven’t a clue how to make whipped cream. 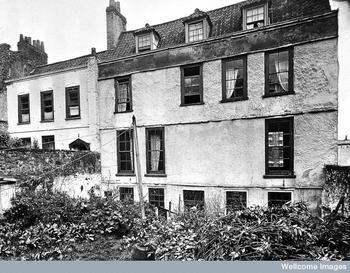 The Lunar society was in fact the prototype of a ‘think tank’ and the Pneumatic Institute the precursor of the ‘research clinic’. The story of both is told in The Atmosphere of Heaven by Mike Jay, (Yale University Press). Let us know what you think. As always, you can check out history or medicine books via our Amazon affiliate link, visit us at medical history tour, or send an email at info@medicalhistorytour.com. T Beddoes, J Watts Considerations on the medicinal use, and on the production of factitious airs. Georgiana, Duchess of Devonshire, and Princess Diana: a parallel. Newer PostMedical History. Heritage or Sociology?